Today's been pretty fun, as I finally finished up a huge project I've been working on for a few weeks. I was doing a video production, and it's a bit more intense and time consuming than I thought it might be. Hopefully I get faster at this! Our only photo session for the weekend was cancelled by some nasty weather Saturday morning. Tomorrow is our son Jackson's 5th birthday! He has been looking forward to this day for a long time, and here come's the bad parent moment, but this will be his first real birthday party. :) In the past it's just been Grandpa and Grandma and us, but this year, Jackson's having a bunch of friends over, and it should be a lot of fun! He asked for tater-tot casserole for lunch, a scavenger hunt complete with maps, and wanted me to hide candy in the backyard for him and his friends to find. Swine flu?? What in the world? Someone needs to teach those pigs to cover their faces when they sneeze. The NFL Draft this past weekend made me anxious for football season. Too bad I have to wait a while. Congrats to Matthew Stafford on being the number one pick in the draft.... My condolences to Matthew Stafford for being picked by the Detroit Lions. Last week, we expressed intent to purchase something on Craigslist, arranged for pickup and payment, and so on and so forth. Only to find out that before we were able to pick up the item, the seller sold it to someone else. What the ham and eggs? I'm a fan of Mountain Dew, but my newest favorite is A&W Cream Soda. Mmmm. Good. Stella climbed our steps today for the first time. She is our 6-month old daughter. I was amazed, and I did not help her at all, although I was the safety net. 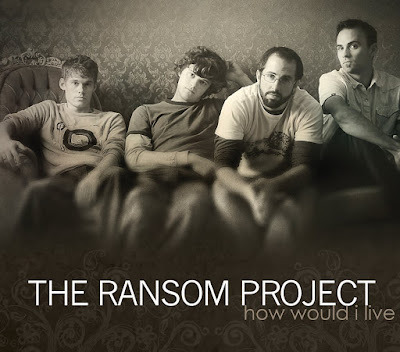 My band "The Ransom Project" are playing our first show since releasing our debut album "How Would I Live" this Sunday night, at 6pm. If you're in the area, stop by. It's at Lower Deer Creek Church in rural Kalona. This is part 2 of our back-to-back weddings this past weekend. Melissa + Chris are cool cats. That pretty much sums it up. We had fun with their engagement session back in September in the Iowa City park. The very nice people that work at the park have, since then, totally wrecked the location we worked with that day, which was created by the flood. Why didn't they ask us first? Come on, people. :) Ask a photographer before you wreck stuff! It was mildly raining on Saturday morning, putting a damper on the plans we had made for their wedding pictures. But, we ended up finding a cool old House Museum to work with for their first glances, which had a nice porch to work under. So while I was waiting for the couple at one point, I grabbed my phone and Twittered "Lousy rain, go away for a few hours" and apparently God has Twitter, because that's what happened! :) It was awesome. Melissa + Chris.... You are a beautiful couple, and we enjoyed working for you both! Since these photo shoots were within a few days of each other, and they are of the same couple.... you get two posts for the price of one, today! Megan + Charlie were lots of fun to work with this past week. They told Jodi that they enjoyed spending time together cooking, so we sought out a friend of ours at Naomi's Kitchen in North Liberty to see if we could do the engagement session there. Then, a few days later, we were honored to photograph their wedding at Parkview Church. It was a short day for us, but we had some fun with Megan + Charlie in downtown Iowa City before the wedding. It was fun hanging out with them, and between locations, Charlie taught us some things about the Marines that we didn't know. For example... the Marines were formed to work security on Navy ships protecting the ship from invaders and the ship's captain from mutiny. I didn't know that. He has been with the Marines for 19 years, so here's huge props to Charlie and all of you serving our country... Thank You! After a beautiful wedding ceremony, the reception was at Ms Susan's Catering and Reception Hall in North Liberty, which is a stellar little place with delicious food and a great staff! Megan + Charlie, you guys were great, and it was fun working with you! We wish you all the very best in your lives together! This wedding was very special to Jodi and I on a personal level, as well as a professional level, because Shelley + Randy have become very dear to us in the past year. Shelley started working for us as office manager last summer sometime, and it was great to get to know her better and become more involved in her life. During the course of work, she started to mention that she was seeing someone.... again. She had dated Randy before, and now their lives were coming back together! So, she packed up and moved to Oregon to be with Randy and get to know his family better, and after a few months, she came home engaged! We couldn't say enough nice things about these two... they were awesome to work with, and had a gorgeous day for the wedding. They were both so relaxed and fun. There were several underlying stories to their wedding day, from Shelley's little brother not liking the color of his tie... to Randy's best man, his brother, being sick the night before and leaving both the family pictures and the ceremony to go throw up... to a bridesmaid getting stung by a wasp during bridal party formals... to Shelley + Randy jumping in a crappy old boat which had no paddles. We planned to keep them close to shore, so it should have been okay, but when Shelley put up her parasol, it acted as a sail! But Randy grabbed a board in the boat that worked as a paddle to get them back to shore!... And, rushing from the reception to our location for twilight photos with the sweet '57 Chevy truck, the newlyweds passed a cop without their headlights on, and somehow didn't get pulled over... it was a full day! Anyway, without further ado, here is Shelley + Randy! Congratulations you two!! You have been a blessing to our family, and we are so happy for you! Thanks for letting us be a part of your lives! See you soon! Here are the some of the words of the song that Shelley wrote for Randy. Don't wake me up if I'm dreaming, never had such a beautiful day. Who would've thought I'd be standing here with the one who's swept me away. You found me, down a long road, no more goodbyes to say. so I'll put my trust in our Father, happy endings are His design. I don't care what the world has to tell you, Love's only found in Him. He walked down, down a long road, New life can now begin. He found us, down a long road, new life can now begin. Jill is a Spanish teacher at a local high school, and Josh has a wonderful story of how he pretended to want to learn a foreign language just so he could meet her. So, we took their engagement photos at the school, to capture what has become a part of their life story. They will tie the knot in May of this year! Amanda and Joe had been waiting so long for this day to finally arrive, that they were about as relaxed a couple as you could ask for. Amanda's health had kept them from getting married last July, like they had planned, so they moved the wedding to this year. Then, she was back in the hospital the week prior to the wedding, and we weren't sure how things were going to go. How many times to you get the chance to photograph the rings with the grooms shoes? Not very many. Joe sang "The Broken Road" to Amanda during the service. It was beautiful!